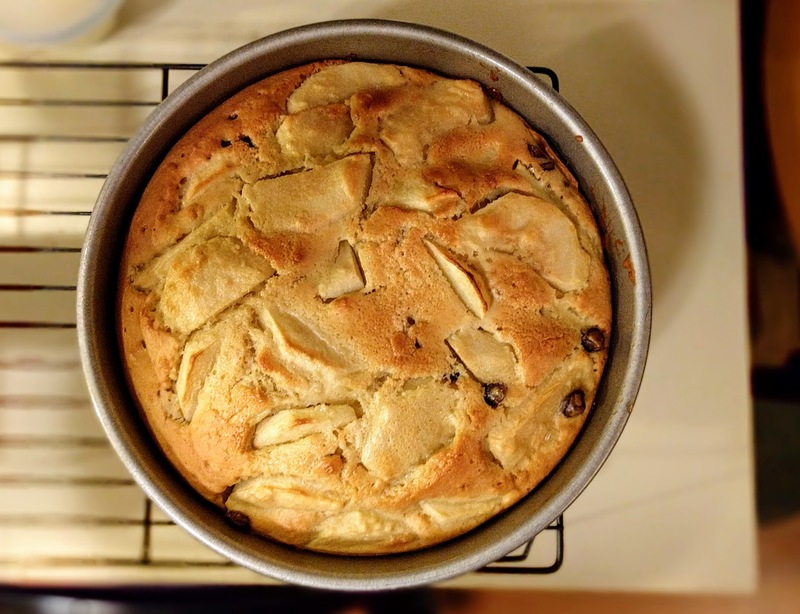 My colleague Jeremy published a post today where he shared his grandmother’s Apple Cake recipe. I loved the story about how his grandmother actually baked this almost every Wednesday when he was growing up. What a lovely memory! So, tonight, in honor of Jeremy’s grandmother, voilà! And oh, it was so, so yummy. I don’t think this is going to make it to the weekend. I didn’t have any rum, but I had just a little tablespoon’s worth of brandy left in a bottle. Same thing, right? I didn’t have any vanilla powder, so I used vanilla extract instead. 150 grams of sugar is about 3/4 cup, but I reduced it to 1/2 cup instead and sprinkled about a tablespoon’s worth on top of the batter just before baking. I substituted unsweetened soymilk for the milk. I added a half-cup of semi-sweet chocolate chips. Next time I might add a whole cup. Because why not?